Theatre Is Easy | Reviews | Where Has Tommy Flowers Gone? 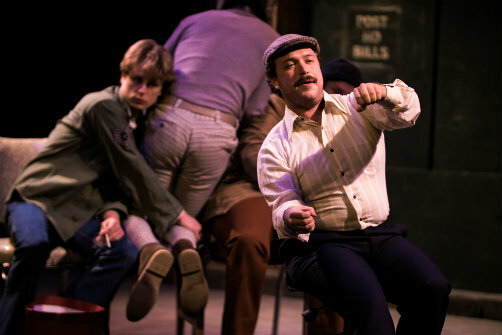 Al Fallick, David Gow, Sam Garber, and Daniel O'Shea in Where Has Tomy Flowers Gone? Photo by Daniel Davila. BOTTOM LINE: An often humorous but disjointed portrait of a deeply troubled, opportunistic hustler in 1970s New York City. “America is a rich country,” says 30-year-old Tommy Flowers (the excellent David Gow). “They can afford me.” It’s a pretty straightforward philosophy. In Tommy’s delusional mind, he should be able to take whatever he fancies, without consequence. This goes for food, shelter, women—you name it. And whether it’s through panhandling or shoplifting, when it comes to material acquisitions, he usually succeeds. Accompanying Tommy is his dog, Arnold (played with great physical humor by Sam Garber), his loyal pal through thick and thin. Terrence McNally's Where Has Tommy Flowers Gone? is set in New York City circa 1970. Tommy’s story unfolds through a series of short, interlocking vignettes: he meets a series of women, including an idealistic sometimes-thief named Nedda Lemon (beautifully acted by Emma Geer) with whom he and Arnold live for a spell, and a homeless former actor named Ben Delight (played with haughty elegance by Daniel O’Shea). It’s clear that Tommy is capable of love, but he’s also slimy, and is carrying around enough angst to make it impossible for him to sustain long-term relationships or much of anything else. What’s more, underneath Tommy’s rejection of social convention—he expresses tremendous contempt for the bland suburban existence chosen by his family and many of his former classmates—is a smoldering rage. But why? “I think about blowing the country up so we can start all over again,” Tommy explains. This isn't just talk. Throughout the play, Tommy periodically reads from a bomb-making guide and presents evidence of his own impressive handiwork. Will he use the explosive device he has created, or is he toying with us? Is this charismatic, manipulative man really capable of violence or he is using his intelligence to keep us guessing about his motivations and intent? It’s never wholly clear in this kaleidoscopic portrait. Early on, we see Tommy back in his Florida high school, bristling at its cookie-cutter conformity. Later, when he hustles his way to New York City, we watch him successfully developing strategies for dealing with the urban struggles he’s facing. Tommy is both admirably wily and undeniably maddening: in addition to his wavering allure, he is sexist, homophobic, and entitled. Then again, perhaps he is simply a product of his time, a white male child of the 1950s. Either way, watching the play forty-six years after it was initially produced exposes the many positive cultural shifts that have occurred since McNally (Tony-winning author of Master Class and Love! Valour! Compassion!) first introduced Tommy Flowers. Nevertheless, the play is both dated and flawed. Despite its length, the production is enigmatic. For example, the audience learns that Tommy was given an honorable discharge from the military, but where and when he served, and why he is not collecting a military pension, remain mysteries. These are odd omissions, especially since the Vietnam War loomed so large during the period evoked. Similarly, Tommy clearly has some sort of ongoing relationship with his family, but their ties are only hinted at and neither explored nor explained. Gaps like these make Where Has Tommy Flowers Gone? unsatisfying, and unfortunately, director Laura Braza's staging isn't really able to fill them in. Although the fast-paced repartee between characters is laced with humor and pithy one-liners, by the end of the night I had no idea where Tommy Flowers had gone. Worse, I didn’t care. Where Has Tommy Flowers Gone? is by Terrence McNally. Directed by Laura Braza. Scenic / Properties Design by Zach Serafin. Lighting Design by Abby May. Sound Design by Cody Hom. Costume Design by Susanne Houstle. Special Effects by Geoff Vitiello. Production Stage Manager is Mariah Pepper Berkowitz. Assistant Stage Manager is Caroline Pace. The cast is Al Fallick, Noelle Franco, Sam Garber, Emma Geer, David Gow, Emily Kitchens, and Daniel O'Shea.